I am the first to admit that when I ran across this recipe a few years ago I laughed. Out loud. The words ‘canned’ and ‘coleslaw’ just do NOT go together, I thought! There’s no way this can work! I am the only person in my house who really likes coleslaw. But the idea of having coleslaw in a jar on the shelf was just too tempting. Coleslaw on hand? Anytime I want? For the rare hot dog I allow myself? To throw together a last minute side dish for a potluck or picnic? So I took a chance and made a batch–what did I have to lose? The ingredients were inexpensive and I figured that at the worst I would have a few pints of soft pickle-ey cabbage that I would have to find creative uses for, right? I even made it easy on myself and bought pre-shredded coleslaw ‘mix’ at the produce shop. And I was amazed. This is GOOD! Yes, it is crunchy, yes it is delicious. You can eat it straight from the jar. You can drain it well, and mix with mayo. It’s GOOD, did I say that yet? You can use less sugar if you prefer. You can use Splenda. Oh, and you can freeze it! Get the printable recipe here and save it to your recipe box. Add syrup to vegetables (or vegetables to the syrup like I did). If you don’t want to can it, you could put it into freezer containers instead and freeze. Leftovers may also be frozen. 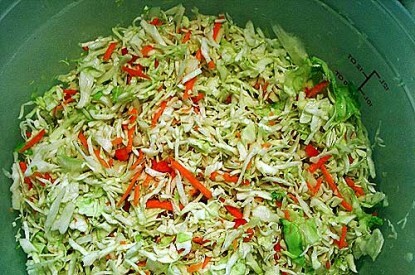 This slaw may be drained before use and mayonnaise added, or used as is. You can also find Dede at Yahoo’s Canning2. Dede, I will be trying this one! I make cole slaw with a very similar recipe only you add oil to the vinegar, celery seed mix, boil and pour over shredded cabbage. I love it. I have two rows of cabbages ready to harvest now! If you have a simply sauerkraut recipe, I could use that one too. 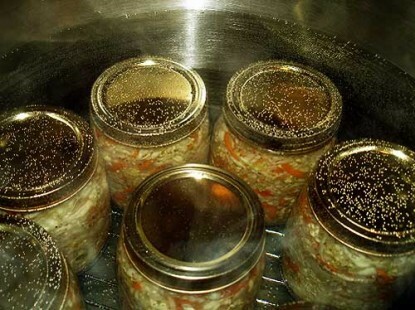 Glenda I do have a good kraut recipe but it’s the traditional ‘crocked’ and fermented method. It’s really good too! I’ll get it posted this morning. Oh man!!!! Now I wish I had planted more cabbages. Hubby would be besides himself with joy to be able to open up a jar of his favorite anytime he wanted to. Thank you for this recipe Dede. I am here to add my thanks for your original post (on C2) of this recipe. It’s absolutely outstanding. The first year I was trying my hand at doing some canning with the WBC, I wanted to try something a little different than just cucumber pickles,jams and jellies and the pickled beets I had already done. The C2 group was in the midst of discussing this recipe you had posted and I could not resist it. It fit in with my trying something different, it looked easy enough and cabbage was on sale for the ridiculous low price of 10 cents a pound. And, you could add mayo (always a good thing in my book) to the finished product. I am here to tell you I have only one quart jar of this left on my shelves. It still is holding up well. It’s crisp and the flavors are still just like the very first jar I tasted. Yum, yum! I highly recommend anyone to try this recipe. You’ll not be disappointed. I have two heads of cabbage ready and waiting! I’m the only coleslaw fan in this house but I love it enough for everyone! Thanks Dede! Oh thanks Phyllis and I just went to search to see how far back on Canning2 that we first talked about this but the search feature is ‘busy’ arggh. One note for everyone – you want to use mayo, not salad dressing with this. It’s sweet but once well drained and mixed with MAYO it’s just perfect. 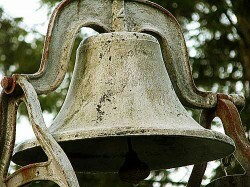 Glenda, the kraut recipe is already in Farm Bell – search for Linda’s Kraut! Because you add a little bit of sugar, and some vinegar, you are saying it’s safe to HWB cabbage? A low acid vegetable. My searches have only found frig/frozen/pickled/dried. If this is true, someone needs to let the USDA know about this revelation. How long is the shelf life for this process? This is great! Making a special trip to the store for coleslaw just doesn’t cut it. Now we can have it when we want it! Thanks so much! 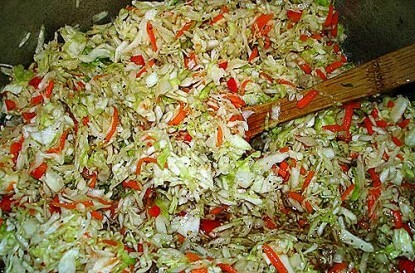 This reminds me some what of the “German Cole Slaw” I make around holdiay time to hand out as gifts. The recipe I have doesn’t require a BWB….just put in pint size jars…keeps in fridge 3 weeks. Nice and crunchy, tart taste. Hey thanks Y’all(Pete-Dede). The row of cabbage in the garden, is soon to become ‘slaw in the jar’. DH will be ecstatic. It just sounded to easy to be true.Thanks again! I made this a few weeks ago and used some for a picnic this weekend. The rave reviews were still coming in on Monday! This mix is delicious and everything was still crisp! LOVE IT! FabHub and I made freezer slaw a couple of years ago, but most of it sat in the freezer until now. It was all old so it was easy to send it to the hogs. 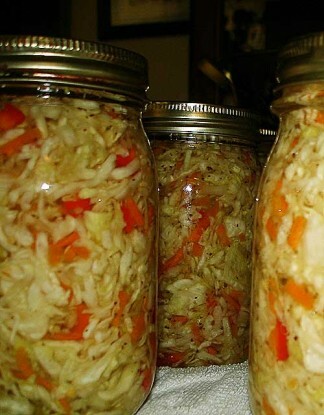 We will enjoy that freezer slaw in its new form as pork chops with a side of this very tasty canned slaw this winter. Wonderful, Sandy – glad you like it. 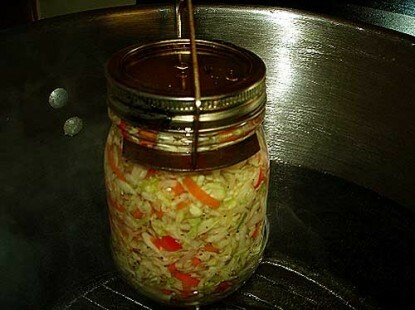 So it’ll be coleslaw all the way around this winter for your house LOL! Oh, boy, you just brought back a childhood memory for me. I haven’t thought about canned coleslaw for decades, but when I saw your pictures it all came back, the taste, the smell, the texture. I loved this as a kid. This recipe sounds exactly right. I still make fresh coleslaw similar to this. I just made 9 pints of this. Only 8 would fit in the canner, so the 9th pint sat in the fridge for a few days. Tried it tonight, and it was GOOD. Can’t wait to try the canned version…I hope it truly does retain its crunchiness. Thanks! Back in June, when it seemed that the cabbage were launching themselves at me from the garden, I made two large batches of this recipe. Made it and admired the beauty of the colorful jars, so like confetti. I had a hard time beleiving it would be crunchy, so had pretty much resigned myself to admiring the jars – jar art, if you will. 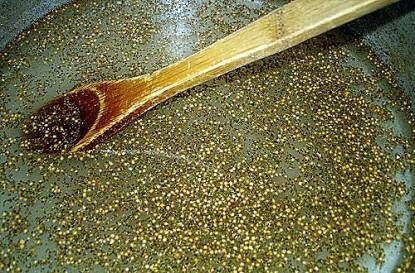 Nervously, I opened a jar last week – and WOWSERS!. Very good, very crunchy. Great on chili dogs or alone. Next year when the volley of cabbage heads begin, I’ll be ready with this recipe. Yum. I wonder how long BWB for 20 oz or qt jars – anyone do those sizes? I have a 5# cabbage fresh from my garden-anxious to try this. Patty, you are going to be happy with this! GOOD STUFF! I can this recipe (in half pints) with half of the sugar. Next round I’ll reduce the sugar a bit more. Good stuff. I have 1 jar left from my first batch from several years ago (in pints this time, that is when I decided half pints worked better for me). Every jar I have opened has been crunchy. One added note – in my opinion the amount of sugar has little influence on food safety here. I found another use for this coleslaw… I use it as the filler for egg rolls. 🙂 Add some shredded chicken and it is a serious winner. I just made another double batch. oh Sandy – what a great idea!!! Just wondering if you could mix together ahead of time and refrigerate. Pack after it has married together for a while. What do you think?